If you’re a self confessed foodie, the Pintxos in Bilbao should be reason enough for you to plan a trip there. It’s one of the things that really stood out on my recent trip to Bilbao, so I thought it was only fair to dedicate an entire blog post to the subject. Pintxos is the Basque Country’s version of tapas and there are age-old traditions that surround it. If you’re new to Bilbao and want to enjoy the foodie delights like a local, there are a few things worth knowing first. Lucky for you, I’ve squeezed them all into this blog post! Bilbao’s Old Town, known as Casco Viejo, is made up of 7 picturesque streets. This is where you’ll find the most authentic Pintxos in Bilbao and where you should definitely embark on a ‘Pintxos crawl’. Each Pintxos establishment has a selection of small plates spread across the bar and you can choose to eat them hot or cold. 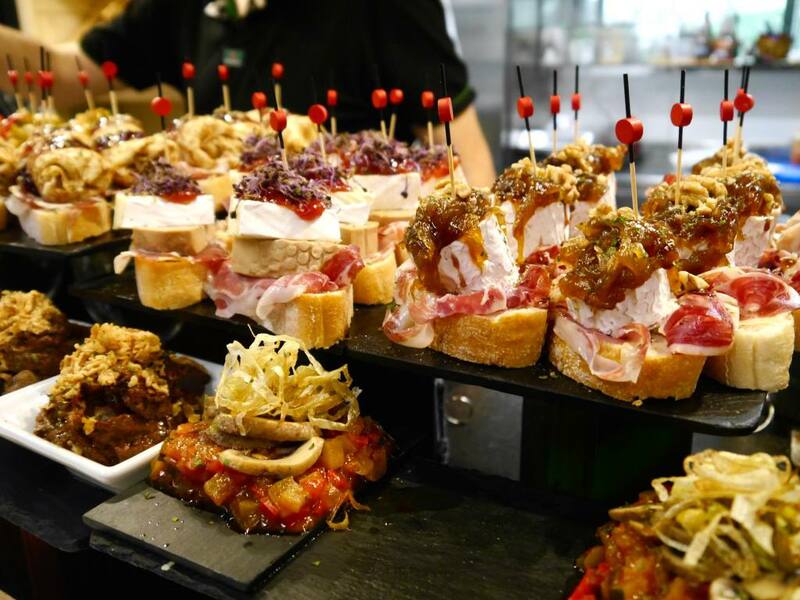 It’s perfectly acceptable to just pop in for 1 drink and 1 Pintxos then move swiftly on to the next establishment, hence the birth of the ‘Pintxos crawl’. 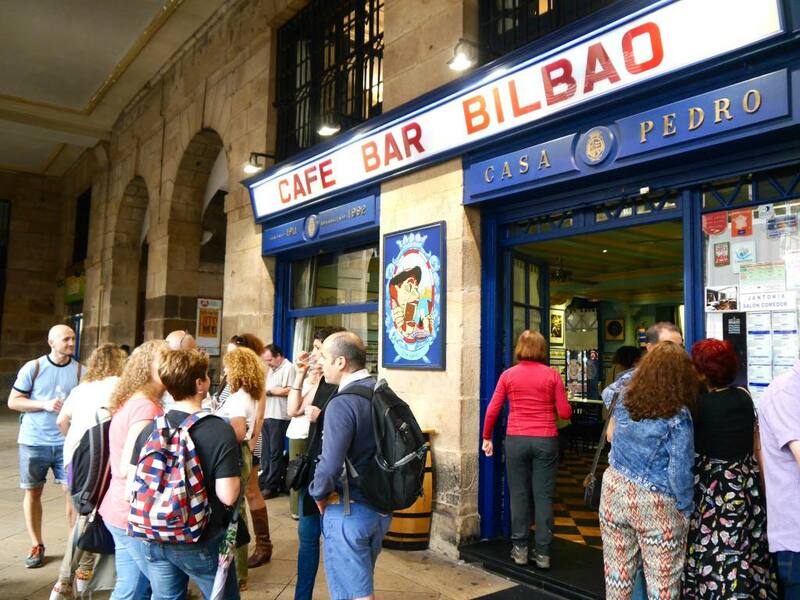 There’s no wrong time to order Pintxos in Bilbao, but the bars are at the most buzzing between 1pm-3pm and 6pm-8pm. This is the lunchtime and pre-dinner rush and when you’ll find the best atmosphere amongst the bars. The Spanish don’t eat dinner until around 9pm, which may come as a shock to some Brits and other foreigners. Going for a few pre-dinner Pintxos is a great way for tourists to keep hunger pangs at bay and enjoy more of a local scene. 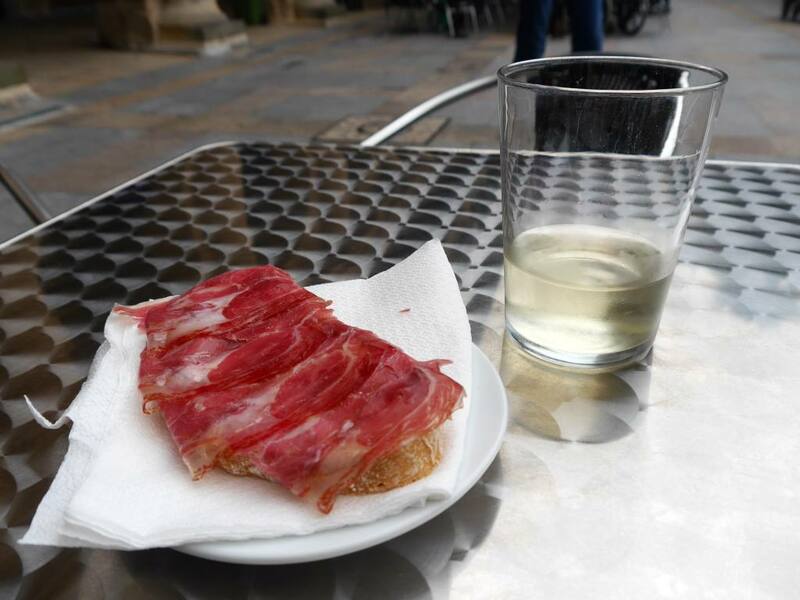 Close to the ‘7 streets’ of the Old Town you’ll find the Plaza Nueva, a sheltered plaza lined with around 20-25 bars all selling delicious Pintxos. 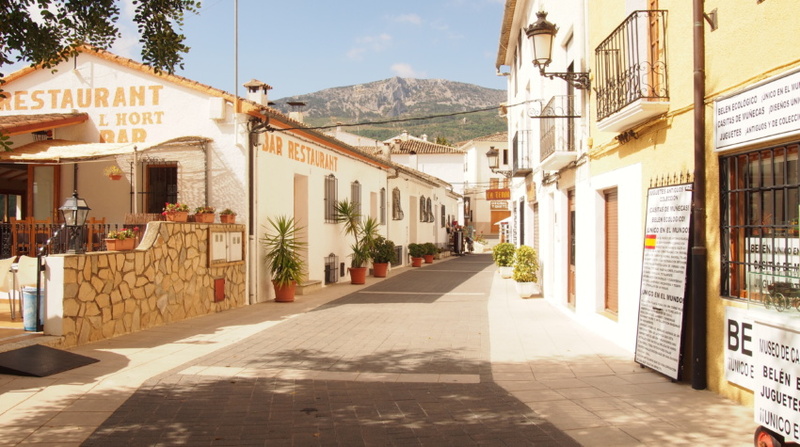 The Plaza Nueva comes alive at weekends and between 6pm and 8pm every night. You’ll see friends and locals mingling around the outside of each bar or stood inside. Some bars such as Victor Montes here have been around for decades and are somewhat of an institution for locals. When you arrive in the Pintxos bars in Bilbao you may wonder why there are so many white paper tissues scattered around the bar. It’s tradition for locals to stand at the bar for a quick drink and a Pintxos, clean up with a tissue and then drop it on the floor. I still find it a bizarre custom but my tour guide told me that it’s totally normal and the bar workers try to sweep them up regularly. Another Pintxos gold mine is the food hall within the Ribera Food Market. Located right on the Nervion River and dating back to the 14th century, the Ribera Food Market is a historic and iconic place in Bilbao. Locals come here to buy their meats, cheeses, fish and vegetables but the food hall is a new addition. Pick your Pintxo, take a seat on one of the communal benches and get ready to keep going back for more. 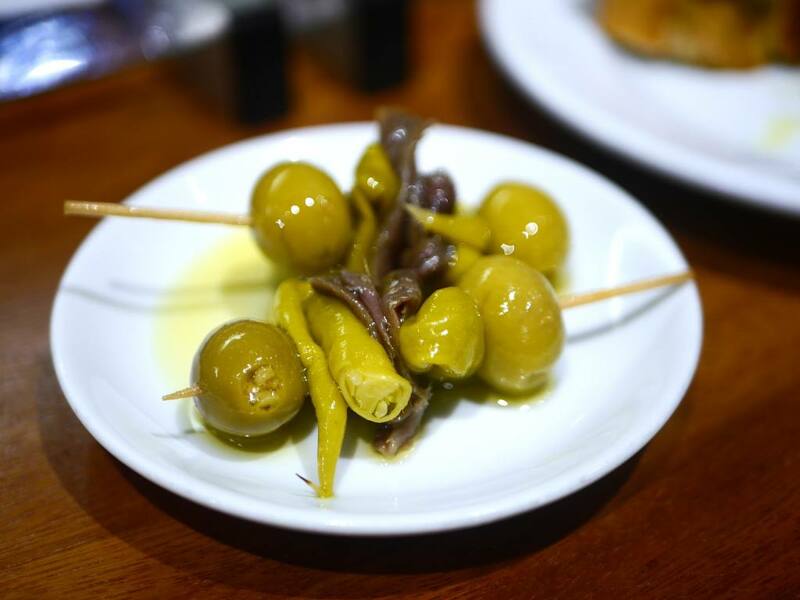 One of the most iconic Pintxos in Bilbao and the wider Basque Country is the ‘Gilda’, consisting of green olives, gherkins, Spanish pickhled green chillies and some salted anchovies. This is all loaded onto a cocktail stick and served cold. Anchovies aren’t my thing, but I couldn’t visit Bilbao without trying the famous Gilda! The dish gets its name from Rita Hayworth’s character in the movie ‘Gilda’ as it’s verde, salado y picante (green, salty and spicy, like the film character). Seems quite a tenuous link but it’s a nickname that has definitely stood the test of time! If you’re looking for somewhere specific to start your foodie adventure, here are two great Pintxos bars I visited whilst in Bilbao. My tour guide took me to both of them, so you can rest assured they come with a local’s approval as well as mine. Pintxos in Bilbao doesn’t come more authentic than this. Come here for a traditional take on Pinxtos with no-frills service and delicious plates. 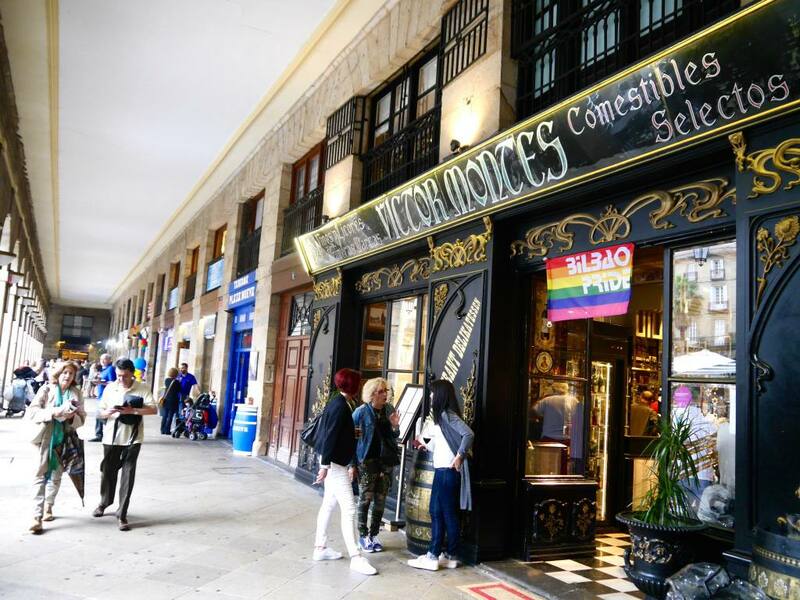 It’s located on the 7th street of the Casco Viejo and is a local favourite. It was here I tried the Gilda as well as a dish with tempura prawn and wild mushroom on crusty bread and drizzled with olive oil. The cost is around 1.80 per plate. Find more reviews here. 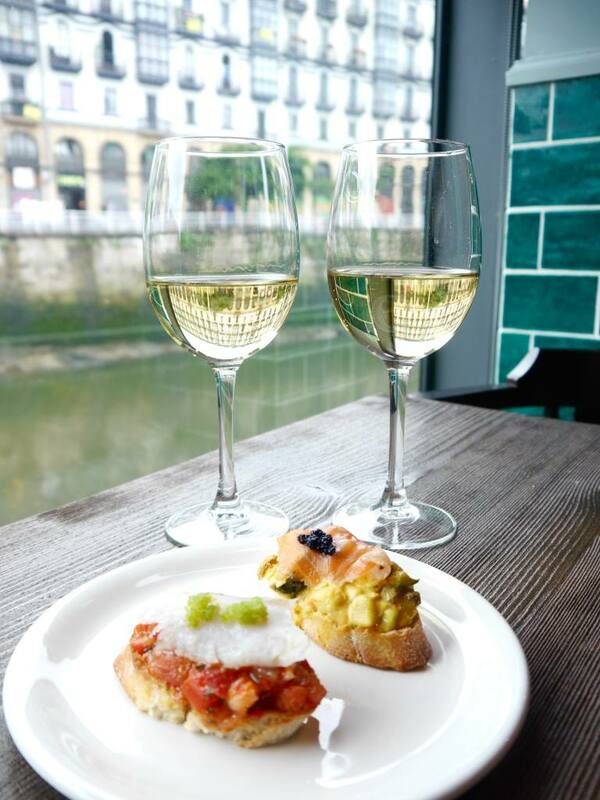 For a modern and more refined take on Pintxos, head to the contemporary Ribera Café. Connected to the Ribera Food Market, the Ribera café is a stylish haunt with daily live jazz music and carefully curated dishes. Come here for a glass of wine and a few plates directly overlooking the river. It’s a unique spot in Bilbao. 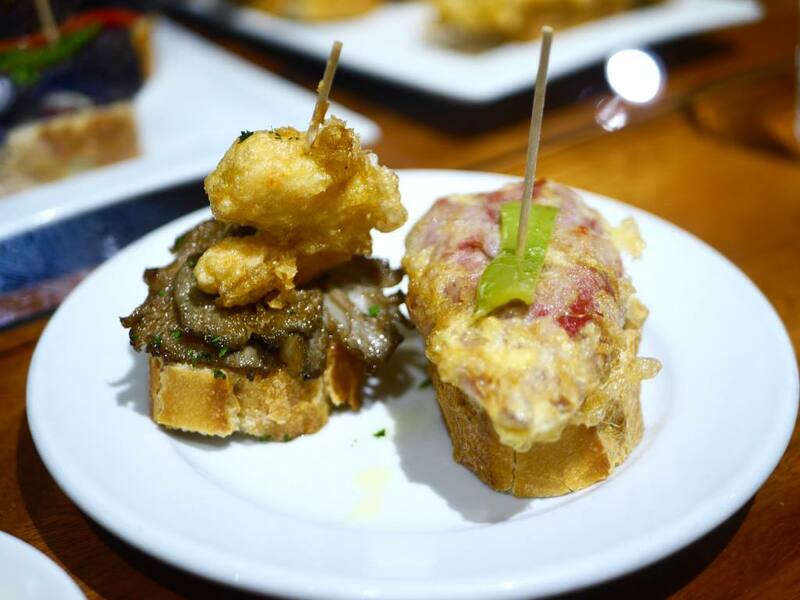 What did you think about my tips about Pintxos in Bilbao? 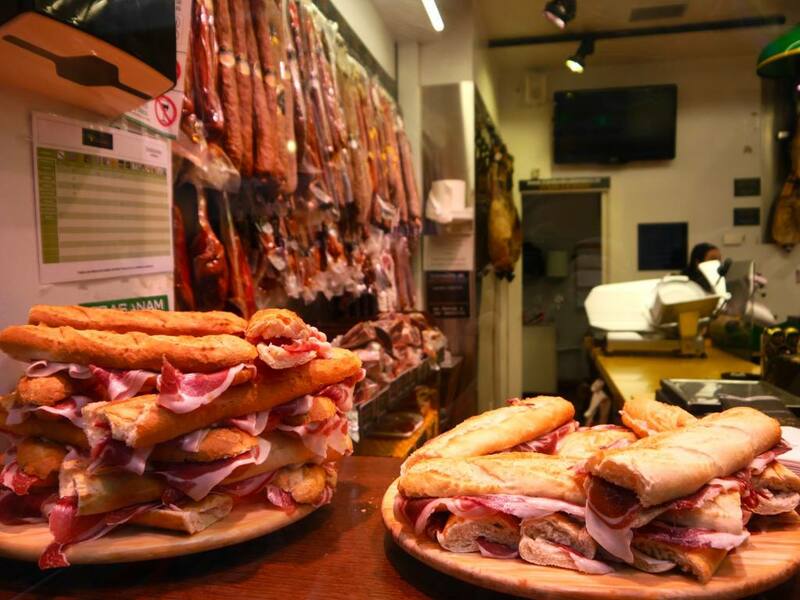 Are you planning your own trip to Bilbao or have these foodie shots inspired you to head to the Basque Country? Or maybe I’ve just given you some serious food cravings! If you enjoyed this post please leave a comment in the box below. 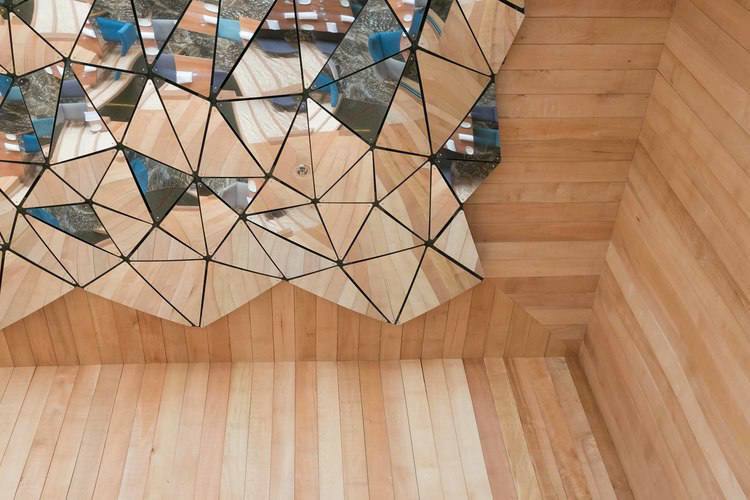 Want to read more about Bilbao? Browse this online Bilbao Guide from the UK Spain Tourist Board. 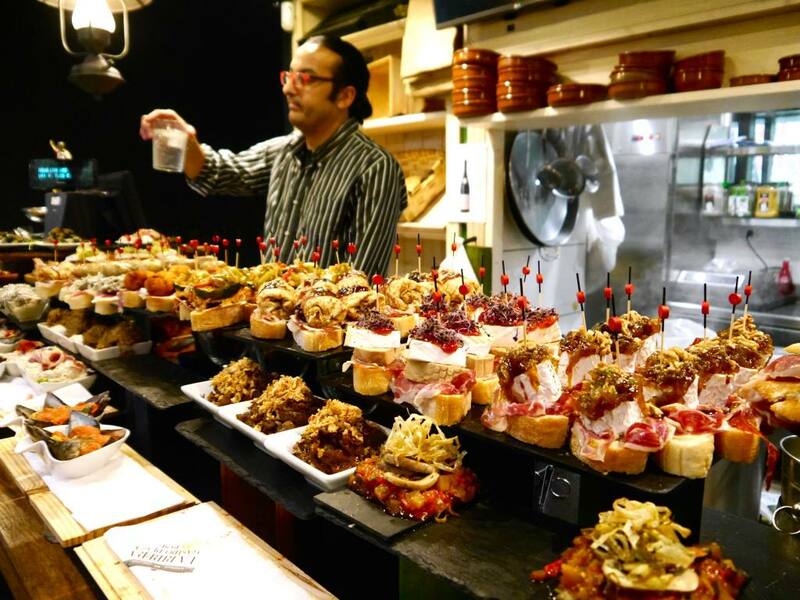 I love pinxtos so this makes me want to go to Bilbao even more! Have you been to Pix in London? They have a few locations (Soho and off Carnaby St) and they serve traditional pinxtos and there’s always a great atmosphere in there! OMG this is such a useful guide!! Having been to Spain twice this year I’m getting a bit obsessed with the food!